Our state is blessed with an increasingly diverse multicultural landscape. Texas, which became a “majority minority” state a decade ago, is growing by about 1,000 people each day, and that rapid growth is accelerating those demographic shifts. That’s why it’s important that the minority groups that are making up a larger share of our state’s population participate in the political process. For minority voters heading to the polls on Tuesday, there’s only one option when choosing the next governor of Texas: state Sen. Wendy Davis. Davis represents a brighter future for minority communities and is the key to fair representation of our state’s diverse population. Davis’ Republican opponent, Attorney General Greg Abbott, represents a party that has called for the repeal of the Voting Rights Act, a landmark piece of legislation that has been crucial to ensuring that minorities in Texas have a voice. When the Texas Legislature in 2011 debated an unnecessary voter ID law, it was Davis who fought to prevent its enactment, exposing how it would disenfranchise minority voters. 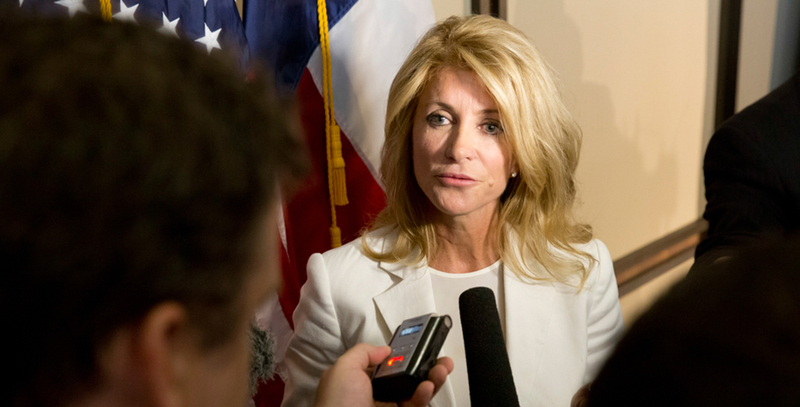 While Abbott remains silent on the issue, Davis has repeatedly illustrated her desire to protect voting rights. Davis has also consistently worked to improve Texas’ public schools. In addition to pushing for more investment in education, she was the leading opponent of major cuts to public education in 2011. She also strongly supports parental engagement and the expansion of pre-kindergarten programs to help give all students a strong social and academic foundation. Davis has also actively pushed for less standardized testing in schools — a top issue for English-language-learning minority students, who often struggle the most to pass these exams. Even at the college level, Davis has coauthored legislation to help ensure affordable opportunities in higher education. Research has shown time and again that education will be key to ensuring the economic success of coming generations, and Davis is second to none in advocating for a quality school system in Texas. Additionally, Davis fights for the fair treatment of immigrants. She supports a comprehensive approach to immigration reform, including allowing essential workers to be employed by American companies and to become tax-paying legal residents. Similarly, Davis supports the Texas DREAM Act, which aids immigrant students in their academic pursuits. Her stance on immigration issues demonstrates her dedication to approaching policy matters with compassion and acumen. Access to quality health care is essential to the basic well-being of all Texans, and Davis is invested in helping everyone, regardless of their background or economic status. The expansion of Medicaid in Texas would benefit a large number of economically challenged minority families and eventually provide a cost savings for Texans in the area of uncompensated care. Davis believes that augmenting this health care system would have immense positive effects on our state economy and would benefit local governments. Perhaps most importantly, Davis is the clear choice for Texas women. A trailblazer on women’s rights, Davis has fought valiantly for legal protection for women, equal pay and an end to sexual violence. In 2013, Davis introduced legislation to provide state-level protections meant to level off the annual $9,349 wage gap between men and women. As half of the state’s population, women should have a strong voice in choosing our next governor, and would be best advised to support someone who has both walked in their shoes and is not afraid to speak out for their welfare. Our state’s diversity is one of its greatest attributes, and there’s no question that our government should be commanded by a leader who is committed to the representation and best interests of our growing minority communities. Davis has proved herself a torchbearer for minority rights on several fronts, and will undoubtedly continue to be a true representative of all Texans, regardless of their race, color, creed or even political affiliation.